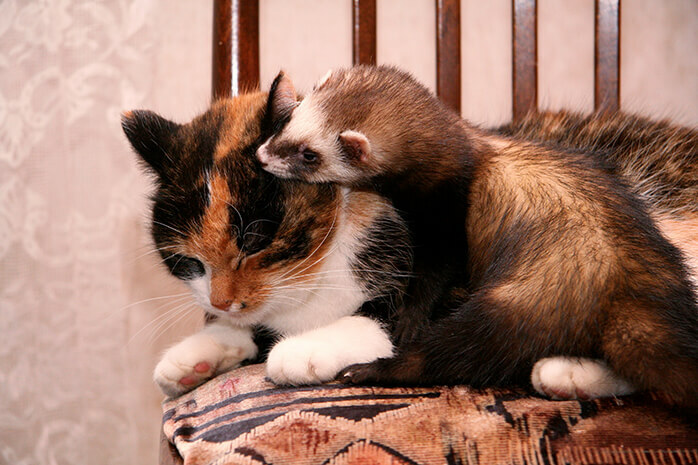 No, ferrets don’t get along with other animals. There are a few exceptions, and even these need to be managed carefully. There are a number of factors which cause problems. Ferrets are natural predators and rodents are their natural prey. Never expose your rodent to a ferret. 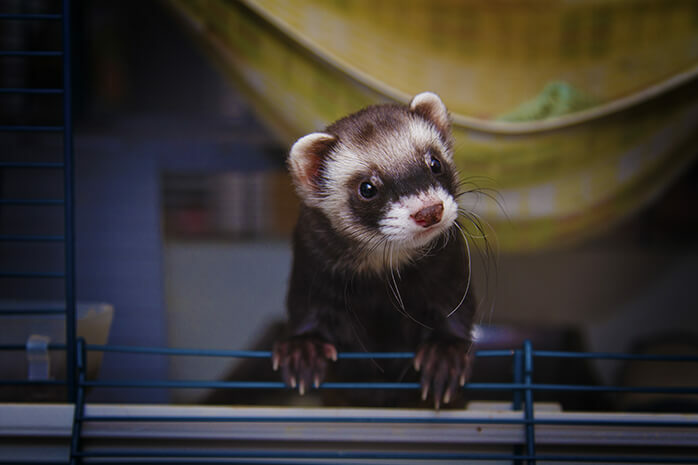 But birds, fish, reptiles, and many other animals are also at risk when kept around ferrets. 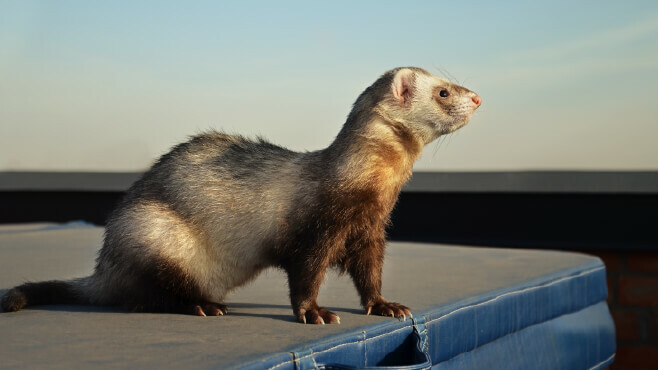 And because ferrets are inquisitive and intelligent, tanks, aquariums and all other sorts of living arrangements need to be very secure to keep a ferret out. 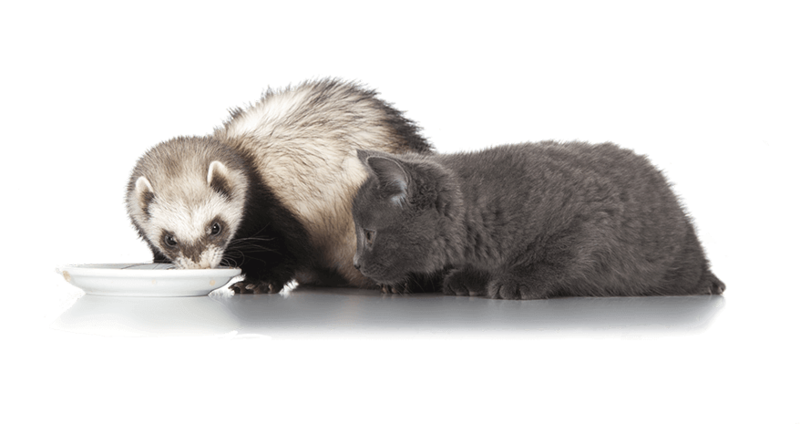 Of all the household pets, cats are the most likely to get along with ferrets. They are similar in size and are both predators, but are very different in personalities. 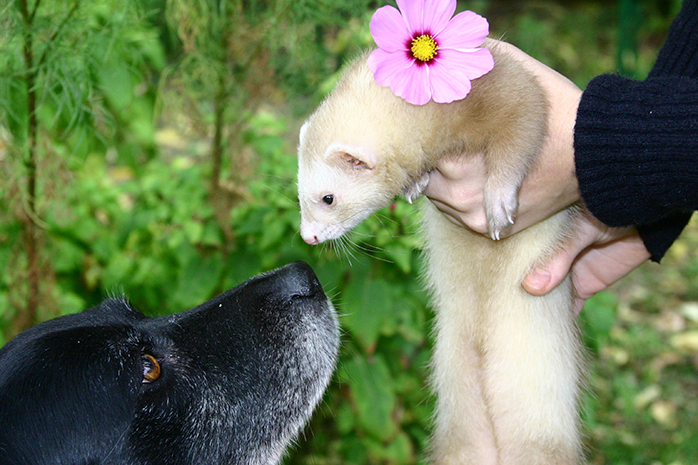 Dogs vary in size and temperament which means while many dogs won’t make a good companion for a ferret, a few will. Terriers have been bred to hunt small animals and are generally not recommended as companions for ferrets. With every rule there are exceptions, and there are stories of terriers getting along, but the risks are high and the chances of it all going well are low. Big dogs are less likely to intentionally hurt a ferret, but pose a risk of accidentally injuring them, or intentionally hurting them when toys or food is involved. Maybe the first thing you need to ask yourself is why you want to introduce your ferret to another animal. Is it for the ferret’s benefit, or is it for the cute factor of them getting along? 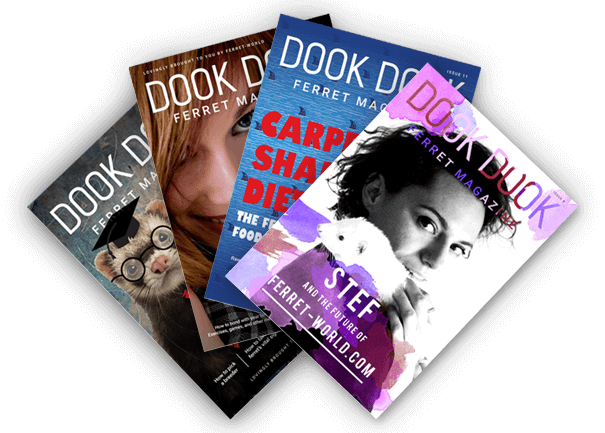 If you want to give your ferret company, the very best choice is another ferret. They can be very social animals and already understand their unusual and aggressive form of play. 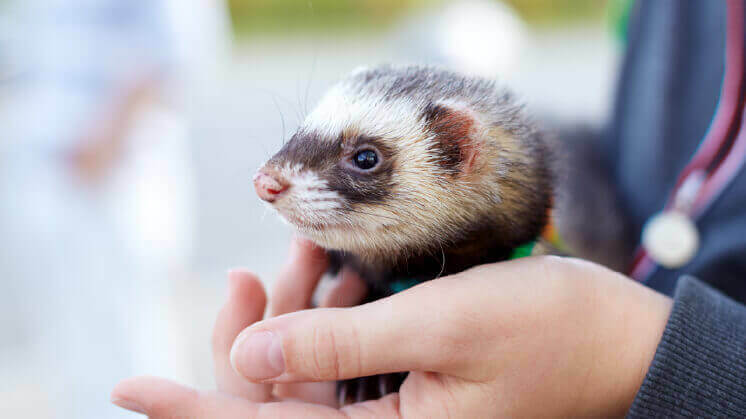 However, it is also important to understand that some ferrets simply won’t get along with other ferrets and making them live together can cause great stress, that can lead to health problems. Some ferrets are simply solitary. When households merge, or for other reasons, sometimes there is no choice but to have other animals in the house with a ferret. And in this situation, it is natural to want to let the animals share the space and be safe with each other. This can work, but it requires patience and some work. Older animals are less interested in change or accepting new members into the family. Older animals are also bigger, but with size also comes confidence and calm. Many believe that it is better to introduce animals when they are young and let them grow up together. And while in some cases this works well, and it can be very cute, there are also risks associated with young animals being harder to train and much more playful. Kits have a tendency to bite, and while they are still being trained out of this behaviour, it is not advisable to introduce them to other animals. 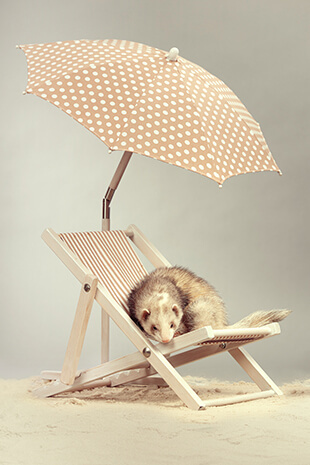 But after this age, young ferrets have made life-long friends with other animals. Because your pets can’t talk, you need to learn how to read their other signals like noises and body language. Always keep in mind that they are not human and some actions by an animal don’t mean what they would if a human did them. We show our teeth when we smile. Baring teeth rarely means an animal is happy. But there are other signals that can be misinterpreted as well. 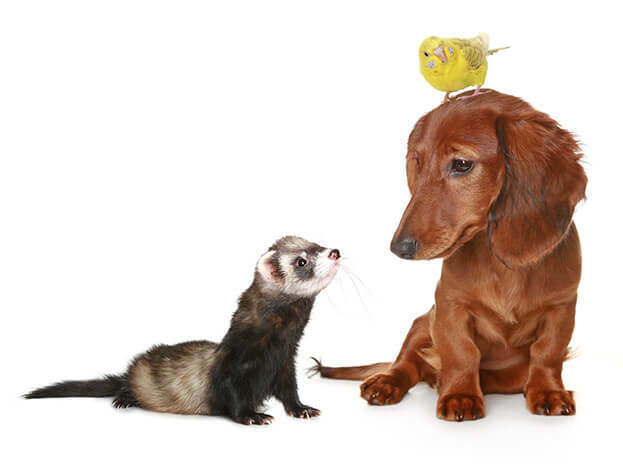 A dog staring fixedly at a ferret and wagging its tail looks like it wants to be friends. But instead it might be happy because it is just about to get a little animal to hunt. Be aware of your ability to misinterpret signals and learn as much as you can first. Commons signs that it is time to separate animals includes hissing, growling, and often general noisiness. Fear and aggression is shown by raising hairs and other actions that make the animal look bigger. Also keep an eye out for hunting patterns like stalking. Animals are incredibly good at picking up on emotional signals. And don’t think you can fake it. They can even smell fear and stress. So it is important to be calm when introducing animals, and you must genuinely feel calm. Take the time to get into the right mood, and patiently move through all of the steps to safely introduce animals so at no stage are you feeling worried about either of them. Then introduce them in a calm, quiet environment and use calm sounds and gestures to let them know everything is alright. Patience is the key to introducing animals together. Start with letting them become aware of each other’s smell. They don’t even need to see each other for this. Give them a few days, not a few minutes. Let it become normal for them. Then while your ferret is in her cage, let them see each other. You may want to keep your other animal in your arms, or on a leash for this and there is no need to bring them close together at first. Just let them have a little time to get used to each other existing. Then on another day, bring them closer and pay close attention to how they both behave. If there is clear aggression or hunting behaviour, you may need to accept that it will never work and abandon the project. After some days, if they have both been giving off the right signals and show some interest in each other, but not too much, then it is time for their introduction. Make sure there are two people, one for each animal, and take it slowly. Never introduce more than one animal at a time. Again, supervise them closely and watch for signs of fear or aggression. Before letting them roam freely in the same space, give them both somewhere safe they can go and make sure they are familiar with it. For cats, you will see that they like to have a high space to retreat to. Ferrets like tunnels and spaces too small for the other animal to get into. Dogs can be territorial and might have a favourite location in the house. Let this location be somewhere other than where they are meeting so the dog can exit and have somewhere familiar to retreat to. Never push things. If they want time out, respect this. Once you’ve successfully introduced your ferret to another animal, there is still work to do. 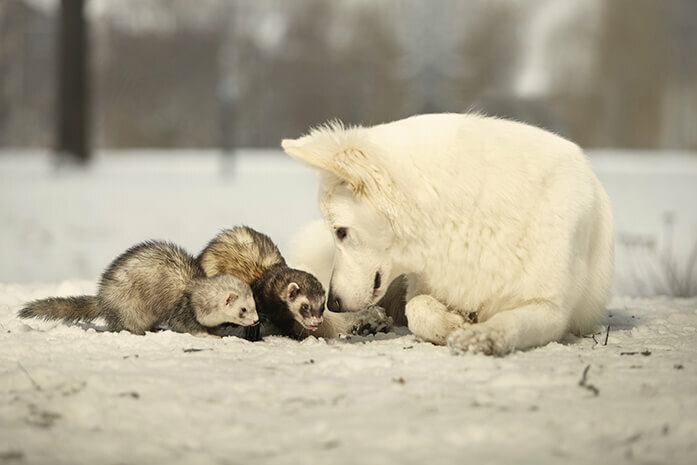 Even though they might get along really well in your presence, some dogs might attack the ferret when you are not around. And while the stakes are low, friendship can come easily. But when toys and food get involved the mood can change too suddenly for you to intervene. Always feed them separately and pay attention to dog toys that might cause territorial behaviour. And not all days are good days. If an animal is not feeling well it will become much more defensive or moody. Be aware of your animals’ moods before letting them interact. If your ferret has been caged for a while, freedom might be so exciting that their behaviour could alarm the other animal. Be aware of this and maybe give your ferret some space to settle down before letting them near even a familiar friend. Some diseases and many parasites like ticks and fleas can jump the species barrier. Animals that get free time roaming outside are more likely to introduce parasites and diseases than those that have lived a protected life inside. 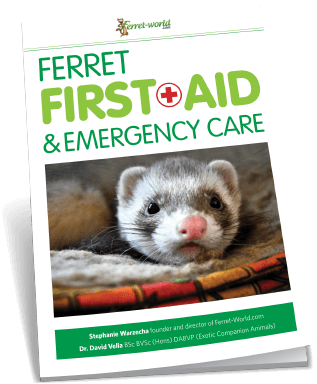 If you’re going to let your ferret build a friendship with an adventurer, make sure you keep your other pet’s vaccinations and health at a high standard as well. Be aware what illnesses can be transferred and keep an eye out for symptoms so that you can quarantine them if necessary.